Apple is getting increasingly aggressive in getting Android users to switch over to its side, thus, we can see that many people now use various idevices including iPad, iPhone, iPod or iWatch. For many Android phone users who also have iPad that runs iOS system, it seems that there is a problem in transferring data or files between Android phone and iPad. Here comes the problem, how can you transfer music from Android to iPad with minimal trouble? Now, we could perform Android to iPad music transfer in various ways, and this guide would introduce you two methods of how to transfer music from Android to iPad. 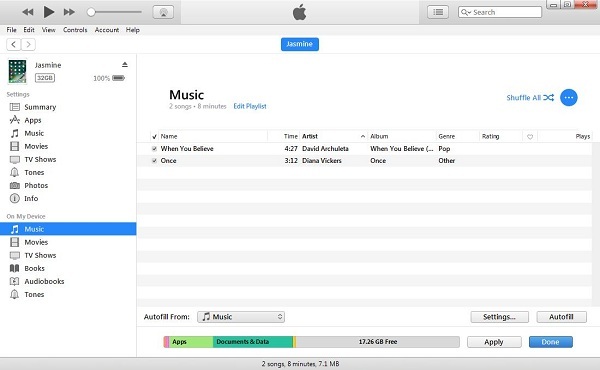 To transfer music with iTunes, you should firstly keep in mind that the latest version of iTunes is already installed on your computer. It’s a manual drag-and-drop method, so you need USB cables for your Android phone and your iPad. 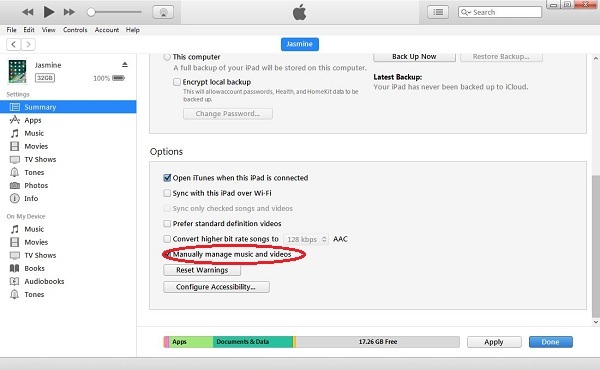 The below steps would show you how to transfer music from Android to iPad. Step1. Connect your Android device to your PC using the USB cable, select your favorite music files from internal memory or SD card, and then copy them into a folder on the desktop. Step2. Run iTunes on your PC and click iPad icon, then it will redirect you to Summary section, you now scroll down here and in the option click “Manually manage music and videos”. Step3. 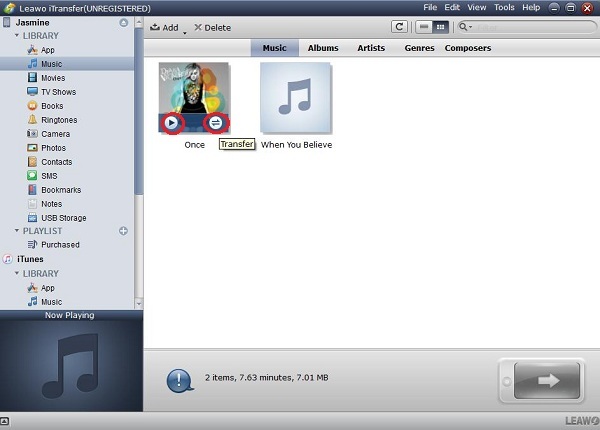 Choose Music from On My Device, at the same time you should open the music folder on your desktop, drag and drop the music files into the iPad music library. Then your songs will be added, so you can now find them in your iPad. To achieve Android to iPad music transfer, what you need is only an Android to iPad transfer tool. It is strongly recommend that you use a fastest and safest solution to transfer music from Android to iPad. Leawo iTransfer is a powerful iPad, iPod and iPhone data transfer program, which provides practical but easy solutions for users to transfer 14 kinds of files, like apps, photos, music, videos, SMS, contacts, and so on between iOS devices, iTunes and PCs. Leawo iTransfer supports the latest iOS devices like iPhone 7, iPhone 7 Plus, the new iPad, etc. You are able to transfer music from Android to iPad with only simple clicks, as well as other files like videos, images, and books. Apart from manage playlists, you can also backup, edit, and restore contacts from your idevice. As for sms or notes that contain important information, you can edit, and export or import them from your idevice. Now you can download and install this powerful iTransfer on your computer. Then, follow the below steps to learn how to transfer music from Android to iPad with this iPad transfer software. Connect your Android phone to your PC using the USB cable, select the music files that you would like to transfer to iPad from its internal memory or SD card, and then copy them into a folder on the desktop. Install iTransfer and connect your iPad to the computer via a USB cable and wait for seconds. Your iPad will be recognized and the files will be loaded. 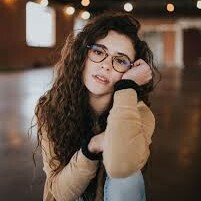 Data and media files are classified into different categories at the left side, so you can view the music files as well as movies, books, photos, contacts, sms, etc. Go to “iPad > Library > Music” tab. You could view all music on your iPad here. Click the Add button from the top, and check the music files you want to transfer, choose them from the music folder on your desktop. You can listen to the music that is already transferred by clicking Preview on the left side. And you can also move the music files out to your computer by clicking the Transfer button on the right. Want to delete duplicate music files? No problem, you just click Delete to remove them with only one click. Note: The above way works the same on your iPhone and iPod. 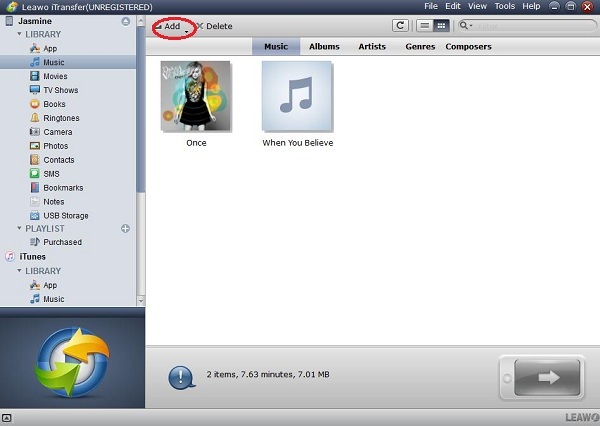 You can transfer music to iPhone or iPod with iTransfer, too. 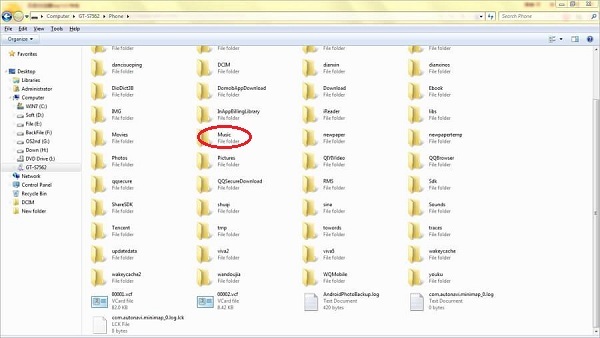 See, the music files can be easily transferred from Android devices to iPad. With Leawo iTransfer, you could also transfer SMS between Android devices and iOS devices. If you’re using a Mac computer, you could make use of Leawo iTransfer for Mac.